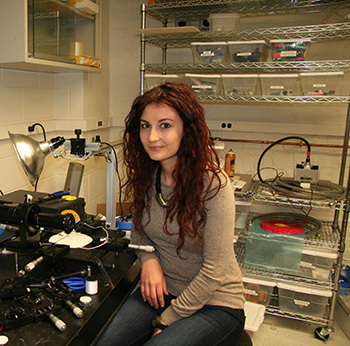 Caterina is a 2017 Beckman Institute Postdoctoral Fellow. She works with the Computational Multiscale Nanosystems Group, the Autonomous Materials Systems Group, and the Bioimaging Science and Technology Group. Explain your job in 50 words or less: My research activity as a Beckman Postdoctoral Fellow is focused on the design, production, and characterization of artificial muscles. In particular, I am working on bio-inspired artificial muscles which aim to reproduce the complex and unique mechanisms of natural muscles and that can be applied in several fields and at different length scales, from robotics to self-healing materials. What excites you about Beckman? The excellence of the research, the multiethnic environment, and the kindness of the people.